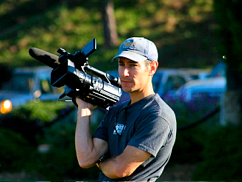 "Dan Herz is one of the most extraordinary media professionals and people I have ever known. He can shoot, write, edit, tell stories, make editorial and artistic decisions and manage people with the very best in the business. Every project he touches turns out superbly. I'd work with him again at the drop of a hat, and I surely hope to, the sooner the better. But if you beat me to the opportunity, I'll be envious and you'll be very fortunate. His professionalism is only matched by his fundamental humanity and integrity and leavened by his terrific sense of humor. " "Dan has worked on a number of successful projects for our company, Its rare to find someone who is both talented, creative and results driven. What has impressed me about Dan is his "can do" attitude in a variety media production, editing and producing needs. His multi-faceted skills are a tremendous value add to any project or organization." "When I needed someone to run my business in my absence, I hired Dan. 'Nuff said"
"I couldn’t be happier with the results from our video shoot. Having 13 testimonials – all which I think are fantastic is a great accomplishment. You and Sean were consummate professionals and a pleasure to work with. You’re a pleasure to work with and don’t hesitate to use me as a reference."